Thursday turned out to be a non sewing day. Delivering quilts to Greenwich took a lot longer than I expected even without the side trip for more leather on the way home. Then it was straight up to Watford to see The Hamsters. It was a good concert and I got to meet up with a couple of people I used to work with. One of whom I hadn't seen in far too long. It was a good night, but for some reason left me utterly exhausted on Friday. Porta loos are not complex and I shouldn't have to read the instuructions multiple times to grasp how they work. I got a little quilting done but no where near as much as I was hoping. My longarm thought this was the ideal time to start causing trouble. I don't agree. I've spent a lot of time fussing over it now and it's sort of working. It will do for what I need right now, but not for leather. So today I knew I was playing catch up and of course the machine still didn't want to help out. It's great when it behaves, but when it has a strop like this it is quite a pain. I've also been having problems with bearding. This is when the wadding comes through the outer layers of your project. In this case I am working with black cotton sateen. It's the same fabric I've used many times before without problems but today I just couldn't get it right. It has given me the oportunity to really play with my wadding and test the theory that changing which side of the wadding faces up will fix the problem. It doesn't make any difference for me. I tried two bamboo blends, two 80/20 cotton poly blends and a cotton wadding. They all bearded about the same amount and behaved exactly the same both ways up. I also tried adding an extra layer of fabric under the sateen. That did help a little. However what made a larger difference was changing the thread. Some colours of thread made the problem a lot worse, some masked it but still pulled wadding through. Having tried 3 dark grey and a black I settled on the best dark grey. I wanted black but I didn't want the bearding. Interestingly all the threads were the same brand the only difference would be dye and processing batch. Could some dyes be more prone to pulling through wadding? Could it be a humidity factor as the black thread is one I have used successfully on this combination in the past? When I have more time I will play with this some more. I would love to get to the bottom of the problem. So with all that I have now completed the quilting I was hoping to have had done by lunch time and I have started on the cutting out. I need to make decisions before I finish the cutting out and I don't think I should be doing that this late in the day so I will leave that for tomorrow. At least I have moved forward albeit more slowly than I would have liked. Oh one last thought. Comment moderation has stayed on because I am finding more than half the coments coming though are spam. What's more it's getting more sophisticated with something that does relate to the post then the advertising, I'm sorry that means comments take longer to appear but I think it does beat the alternative and as it appears humans are doing it manually there is no point using the validation letters to try and weed it out. What I find really frustrating is it must work for them to keep trying it, so people must be following the links and actually buying stuff. Why would anyone do that? I've been working on my bodice patterns the last two days. Given my weight always fluctuates wildly I knew I would have to leave this as late as I could to be fairly sure of a good fit, and yes I was expecting some fitting issues. I started by making up a test garment of a pattern I've used before and is customised to my shape. It wasn't too bad except for the hulk feature at the back and shoulders and upper arms. OK I would have to start over. Taking my measurements told I am now bigger in the back than I have ever been. Whups. So I redrew the pattern and tested the revised version. Hmm, now it's way too big in the waist and bust?! Just before I went for the third attempt a thought hit me. Could it be I have only bulked up in the shoulders and upper arms? Well I now understand why tailors just grab seams and rip them. At this stage it saves a lot of time and works fine. I quickly extracted the front of the first bodice and attached it to the new (huge) back. Bingo, it fits. I can only assume all this heavy lifting and hand guided quilting has had an effect. When a leg of mutton sleeve is tight you know things are going strange. Still I have a solution now here's hoping I can stay roughly the same size for nearly a month. Any bets? I had hoped to get these up sooner, but I spent yesterday recovering from the show and working on making a pattern. These are just a few pictures from the exhibition this weekend. 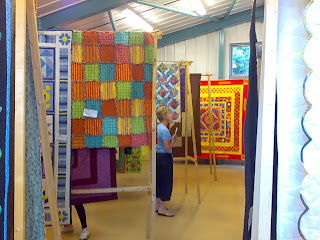 As you can see there were a lot of quilts there and the hall was full. It wasn't long ago when Jenny was quite worried she wouldn't have enough quilts then at the last minute there was a rush. From 20 to over 80 in a little over a week. Thursday night we got into the hall and saw the stands for the first time. They all went up surprisingly quickly but then we could see how huge they really were. How would we fit all the quilts in? Well there wasn't time to worry so we started hanging and just worked at doing out best. After two rounds of synchronised frame dancing we did it. There were only 4 student/customer quilts that didn't get hung, and many thanks to my students who were very understanding about this. By the end of the night we knew we had done everything we could and now it was out of our hands. Friday morning we found a queue of people waiting to come in. Surprising but wonderful. 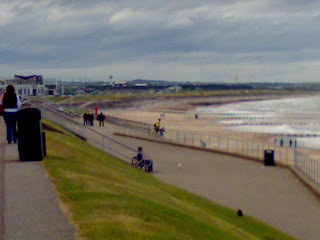 The whole day was busy with a steady stream of people in and out. I was pleased we could send them down to the shop for their cream teas as it stopped the hall getting too crowded. I'm not sure how the shop coped though. It's a lot smaller than the hall. 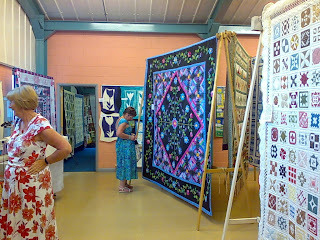 As well as talking to the visitors I was demonstrating frame quilting. 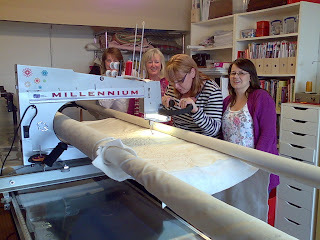 I love getting the chance to show people how frame quilting works as it still seems to be very misunderstood. It's also a nice home set up so I have no qualms about helping sell them. It's the Husqvarna Megaquilter and frame set up. It's a joy to load and I wish my frame was as easy. I've never been a fan of pins and I have to use a lot of them to load a quilt on my system. Saturday was a little quieter. Frankly that was a relief. I was exhausted after the Friday despite Dougs stready supply of refreshments. I guess that the cream teas still went very well as the ones that made it up to us were a lot smaller on the Saturday :) Doug is famous for his cream teas and justly so. The Home workshop were with us for both days with a selection of their books. It was great to be talking to someone and not only be able to say, there's a book on that, but be able to show them it too. I hope some of them sold. They also brought their small person with them. They seem to be trying to lead her astray already and I am sure she would love to have a quilting frame, she seemed really interested in the idea of drawing with a sewing machine. Saturday evening the team appeared to get the show down. Boy was it quick to pack away. It's amazing how much faster take down is than set up, even when you have exacly the same amount of stuff to move. I guess it helps having gravity working with you. I can't wait to find out who won the visitors choice. 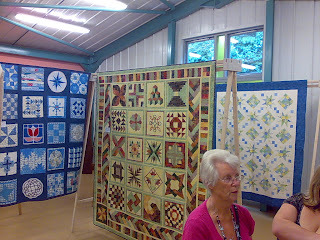 I know there were two very popular quilts, but there were also a lot of votes. It was fun to see people suddenly realise how hard it is to find the best quilt in the show. Now I have a customer quilt I need to get done and then I have to get back to some of my work. So enough talking and off to work I go. An unusual picture today. This is the hall set up for my talk last night with someone else speaking. The lady was from the air ambulance and had come for the quilt to the left. The quilt had been made by 25 members of the group and will be raffled to raise funds. I was very happy to be there to see the hand over and that the representative chose to stay for my talk. I hop she enjoyed it. As ever I enjoy being further north. The welcme is always warm with lots of interesting questions and friendly helpers. The van is still one of the stars of the show. Many people are thrilled to actually meet it. I am pleased as I have now worked out how to load my full talk and still use the bed, cooker, table and bathroom. It's taken a while to figure that one out. It's only a little van and my talk is really quite large. Today I will be helping to hand the exhibition at Patchwork Corner. It's funny that last nights group are just about to celebrate their 10th birthday and that is what the Patchwork Corner event is too. I thought that was a nice link and I hope the group have a great event. I'm sure we will, come over and see us either tomorrow or Saturday. I am parked up outside Walcote village hall, my venue for tonight. 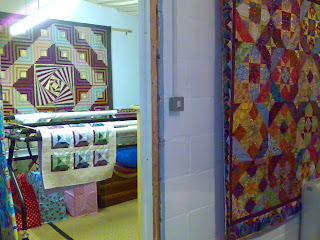 I have just shut all thne vents in anticipation of the quilters arriving and the rain took that as a cue. I'm impressed the weather is so well behaved here. I've made good use of my time and the quilt is now growing well. I love this phase of a project. 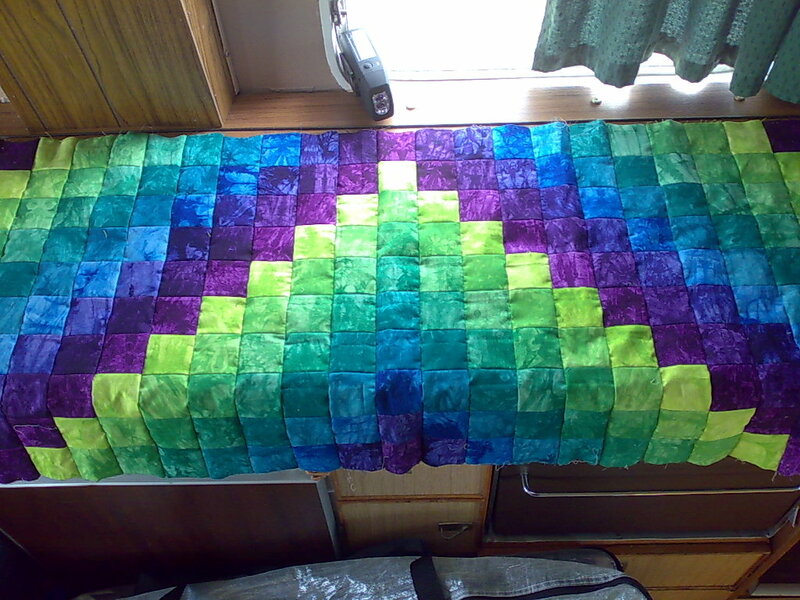 It seems that each little piece clearly moves the quilt on. I have come to the conclusion the van table is too low for cutting on. I can do some but my back protests pretty quickly. I think I will invest in a smaller mat that I can put on the counter which is higher but narrower. It won't do for everything but if I use it when I can I can save my back for when I need the bigger space. I should probably get this sent. I would think the quilters will arive any minute. I'll share one last thing that has been amusing me today. When the van is parked I sit and listen to Radio 4 on my little solar radio while sewing. When I drive it's back to loud heavy metal music ;) I can't help wondering how confused people are when they see/hear this transision. Well I made it to Oxford ontime despite the best efforts of DHL. It did take several call to get the package to appear. Despite being quite close and having been assured I would like Oxford I don't go there. The problem is it is very vehicle unfriendly. There are speed bumps bigger that mountains and parking is at best difficult. However we had checked the venue on google maps the night before and found it had two big carparks. Great? Wrong neither allow caravans and knowing Oxfords view on vehicles they would take the chance to fine a motorhome. Besides which they promised a fine for anyone not fully within their really quite small bays. So from having lots of easy parking I now had none. Fortunately I have the sort of friends I can call and ask for help. We managed to get a number for the previous co-ordinator of the group and put them on the case. By the time they arrived one of the members had persuaded the caretake of the next door sports center to help out. He was very nice and let me put my van in their private carpark. It was a little further from the venue but that was no problem. I don't think I have ever had a better unloading team. Quick, keen and strong. I was unloaded in no time, thank you all, it is very much appreciated. The talk went well despite the heat and the group asked a lot of interesting questions. They also have bonus points for very cold water and great coffee. All in all the group turned a disadter into a good evening. I hope I will see some of you again maybe this weekend at Patchwork Corner. Did I mention I have a lot of work on at the moment? Yes. I thought I might have. Well this evening I am giving a talk in Oxford, but it's fairly close so I expected to get a good amount of quilting done today. However it's not worked out like that. Thursday we were expecting a package to be delivered. I work on a Thursday but as it was to be delivered before 10.30 am it wasn't a problem. The failed delivery card said they had tried at 2.45pm, when guess what, there was no answer. OK Friday, the driver said he would come late after 9, it sounded like he would make us his last delivery. Great, but to be on the safe side I got home as soon as I could, 6.45. No card so I assumed (yes I should have known better) that all was well. 10.30 we checked the tracking data and apparently delivery was attempted and a card left at 6.30. Admittedly I haven't taken up the hall carpet, but I have had a very good look for that card. I don't think it made it to our house. DHL unlike many couriers try three times. Frankly thats a shame as I could easily have picked it up from their depot on the way out today but who knows third time lucky? We called the driver again, he was surprisingly precise and declared he would arrive between 1pm and 1.30. OK, not ideal but I can cope. I can't sew as that can drown out the door bell so I have had to find a string of very quiet jobs. I've prepared quilting patterns for skirt panels and cut and test fitted another patter. I've also discover one of my designs needs enlarging before I can use it. All that while rushing to the door every time a vehicle stopped in the road. Any guess where the story finishes? Well I now need to start loading the van for tonight and there is no package. He isn't even answering his phone now either. Gee maybe I was mean refusing to have anything shipped DHL ever. Then again, maybe I wasn't. Wanna take bets on what time the driver will try to deliver today? It may not look like a lot of progress but I would say I've done about half the sewing in this project. All the strip sets are now complete so I have started the real piecing phase. You may be able to tell that the piece in progress hasn't been pressed. This is because the van has very limited electricity at the moment. We are looking for solutions to this but for now pressing is a luxury I don't usually have. Oddly my points seem to be better than nomal. I don't know it it is because of the lack of pressin or the fact I am working on a hand cranked machine. Maybe I am being more careful because I know there is more potential to go wrong. Whatever the reason I am very pleased with the result. I have been busy this week, it's been the last week of term. This is the point of the year when I am trying to fit in everything at once. Next week would normally be a little easier, but not this year. I am giving two talks, one in Oxford and one in Lutterworth. Then on Friday and Saturday I will be demonstrating frame quilting at Patchwork Corner's 10th birthday exhibition. 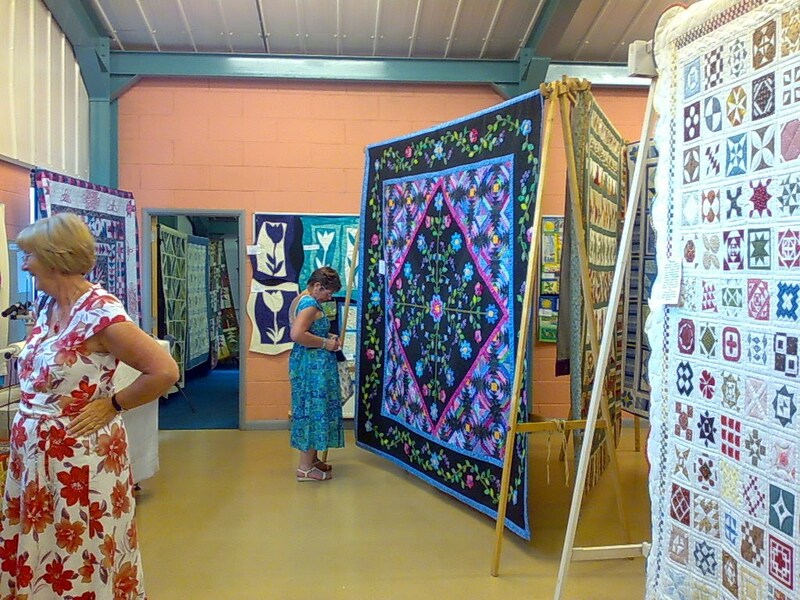 There will be a great selection of quilts on display, demonsrations and cream teas. Hope to see some of you there. Finally, there are a couple of places available on my Wednesday afternoon classes at Patchwork Corner. If you would like to join the class please contact Patchwork Corner directly. While I was quilting Holiday Starrfire we took some video to show how it was done. We remebered it today and got it uploaded so I can now share it with you. I would like to point out that my ruler technique isn't the official one. I don't have a stitch reglator on the machine so I just reduce my speed a little and cheat. It works for me, at least with that ruler it does (yes this is one of the ones I was trying to remember the name of last week). I suppose I really use it more like an extra guide and bump the foot with it. The needle of the machine isn't moving as slowly as the video might suggest. If you look carefully you will see you appear to get several stitches for one stroke of the needle. This is caused by the machine running too fast for the camera to pick up the motion. The camera also wasn't keen on some of my fabrics. I guess they are kinda bright and high contrast. Anyway, enough of me jabbering. Hope you enjoy the video. If you would like me to film more let me know and I am open to (clean, quilt related) suggestions for future videos. In Norfolk we were making the Autumn Leaves quilt. By the end fo rhte day most people had the background ready, binding prepared and some leaves. I think with another half hours work (the class finihsed at 3.30 rather than 4pm) most would have had a good stack of leaves. I look forward to seeing the finished quilts. Hopefully some will be ready to go on the wall for autumn this year. After that I headed home again. Oh boy was that hot and horrible. 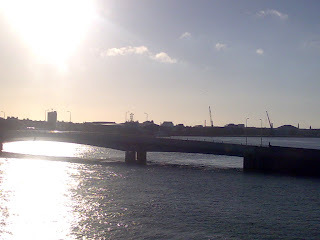 as I got closer and closer I could feel the temperature rising (bear in mind it was gone 6pm). To add to the joy there was no where to park anywhere near the house. Thanks to Harrow Council reducing the number of parking spaces this is the new fun game. Drive round and around your house till someone leaves. It was too hot for that so I took advantage of having a camper van. I drove away until I found a space and parked up. I cool drink and some time to relax helps a lot. An hour later there was a space. Since then I have mostly been too hot to do anything. I have done a little quilting, but being too hot to think tends to lead to accidents and I can't unpick on this one so I have to just stop. It's frustrating but what can I do. Well I can copy the head wear of our mechanic. Doug was sporting a wet towel yesterday and swears that it helps. I think I may give it a go. I also have plans for other cooling head gear, just as soon as I have time. 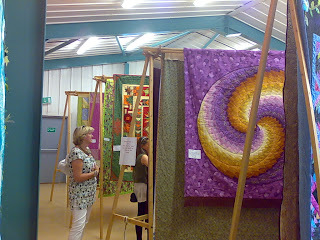 Finally and only a little late (well it went live while I was in Scotland) The Quilt Show, put up a little slide show of my winning quilts from Sandown and Malvern. It's here if you would like to have a look. That's another Scottish trip over. In the photo you can see those who stayed to the very end. Including our host and organizer Linzi hiding behind her machine. That's fine as Tracy was more than able to drive it. We got through a lot more than I expected and not as much as I wanted which I think is OK. It's amazing how many tips and tricks you can share over a couple of days. For me one of the highlights was the diversity of people there. Linzi chose to open the retreat up to anyone with a frame quilting system whatever it's size. That worked really well and encouraged people to think of different ways to work with quilts. I suspect that even sit down quilteres would have got a lot from the weekend as many of the techniques would transfer, and their machines are usually a lot easier to move. If you didn't make it this time you will be pleased to know we are already hassling Linzi to plan another. 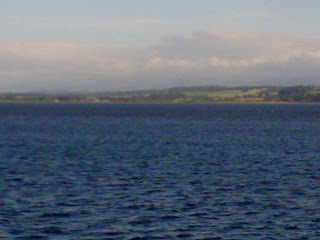 It's a lovely place (with two quilt shops close by) and getting away for a few days to learn is very theraputic. The other picture today is of Aberdeen seafront where we went for fish and chips on Sunday night. We had food in a different place each night which did add to the holiday feel (well for me at least). I hope the students enjoyed it as much as I did and I can't wait for the next event. I'm about an hour outside London. I do love the sleeper train. It is so much simpler and more civilised than flying. I also think the Scotrail staff are lovely. They work hard to make this trip special, and I for one appreciate their efforts. Quilts, gin and bacardi. That has been the theme for this retreat. Today we have been focusing on feathers, and a few leaves. We have also done some basic maintenance, wthreads and needles. My train pulled into the station as Linzi my host for the weekend pulled into the car park. Perfect timing. A quick drive and then a second breakfast before 8am. The second one was much better as was the coffee. The retreat classes are being held in Linzi's workshop. As you can see it's well decorated with quilting inspiration. It's a lovely place to work with lots of space. I was teaching various ways with feathers. It is amazing how different people are and how well they progress once they find a method that fits for them. Today we had a good range of different styles, but they seem to have all improved. We have just been for dinner at a local bistro and on the way home we got to visit some 2 week old kittens.now it's time for drinks then bed. I'm rather looking forward to it as I am stayinf in a yurt. Not the quilted one admittedly, but still a yurt. I've loved my trip on the train, but it's been like stepping into an alternate reality. Unlike flying everyone has been friendly and helpful, it's almost a community in it's own right. I did find that the train being stationary would wake me up but I quite enjoyed looking at the sleeping stations on the way. 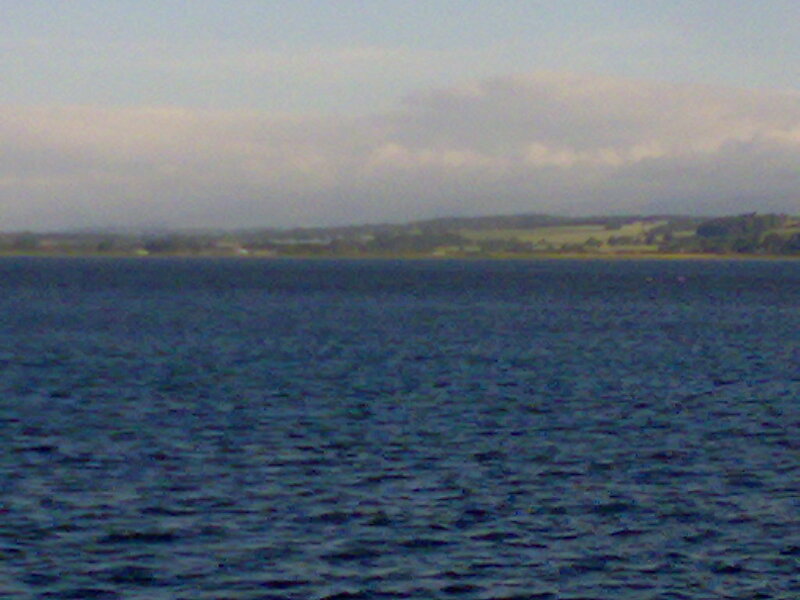 Before I forget the photos are Montrose. 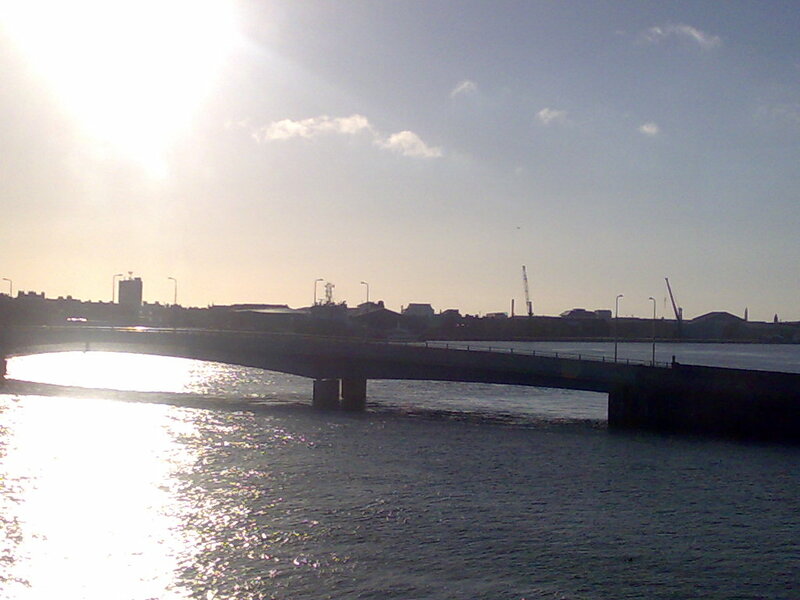 It's lovely scenary but very bright and sunny. The dinner last night was excellent and not overy expensive, but breakfast is more like airline good. I'll try the continental on the way home. The 'cell', as one of the other passengers described it, is small but functional. I've stayed far worse places. The bed is confortable and it was great to be in a cool room. Speaking of which, I need to get ready for my stop. Next update will be from the frame quilting retreat. Note not the longarm retreat. Linzi has opened it up to any frame quilter which strikes me as a great idea. I won't quite cover the whole length of the island today but I am taking a fair stab at it. I started early heading South to West Sussex. Even at 6am it was really too hot. I am so impressed my audience managed to stay awake. I was struggling and I was moving around. For those who missed th talk (I heard the traffic was terrible) I will be in the area a few times soon, so check the calendar on my main site. I've now made it back up to London and brunch. I think I've boiled my brain sitting in traffic on the M25. Still I should have time to head to my storage unit and unload the car before going into London to get my train. The most appealing feature of the train is the air conditioning. I am so looking forward to being a sensible temperature. I suppose I should finish lunch and get moving again. I'd much rather just sit here, there is air con here too. Due to the absurd amount of spam I have just had to clean out of my blog I've turned on comment moderation. I will pass all real comments as quickly as I can but I can't afford the time to clean up after idiots. I don't use the word verification as I struggle with them and I know a fair number of others do too. Please do continue to comment and I will get them up as soon as possible. Sorry for the inconvenience. My baby is back home and much happier. Passed his MOT and some servicing done. They managed to get him running a lot better, the valve seat had worn (thanks to unleaded fuel) and he was running on myabe 4 of his 6 cylinders. It's also very cool that my mechanic is now able to do MOT's. They are nice guys there who really get vehicles. No main dealer uniforms (or prices) just honest work. Frankly I think they need to put their prices up a but they will work that out as they get busier. If you need a mechnic in the North London are please condider them. They are The MOT Center, Unit 3, Tilling Way, East Lane Business Park, Wembley HA9 7NQ, 020 8908 0898. If you are interested in getting them to do your MOT and are likely to see me, ask for a flyer as they are offering discounts with the flyer. The car is now loaded up ready for my talk in Horsham tomorrow morning, and I think it is time to head over to Hemel for todays classes. I will be taking the van, then I can sit and sew between (and before) work. 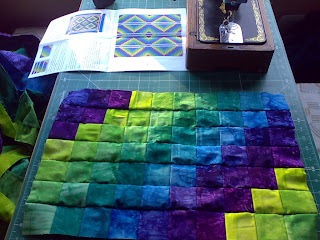 I am really enjoying reclaiming these small pockets of time, and the quilt is coming on well.